An ISC Kosmotras Dnepr carrier rocket has launched eight satellites into Low Earth orbit. The rocket lifted off from Dombarovsky in southern Russia at 07:12 UTC (13:12 local time) on Wednesday. The primary payload of this, the seventeenth Dnepr launch, was Ukraine’s Sich-2 remote sensing satellite. Built by the Yuzhnoye Design Bureau, Sich-2 is based on the MS-2-8 satellite bus. It has a mass of 169 kilograms, and is expected to operate for five years. The satellite carries optical and infrared imagers, which will be used to produce images for agricultural and development planning, mapping, and monitoring natural disasters. Sich-2 is the third spacecraft to be launched in a series of Ukrainian satellites named Sich, meaning Owl. The first, Sich-1, was placed into orbit by a Tsyklon-3 carrier rocket in August 1995. Based on a former Soviet Okean-O1 remote sensing satellite, it was the first Ukrainian satellite to be launched since the collapse of the Soviet Union. The first Chilean satellite, FASAT-Alfa, was intended to have been deployed from Sich-1, however it failed to separate. The second Sich satellite, Sich-1M, was also based on an Okean-O1 satellite, and launched by a Tsyklon-3. Its launch took place on 24 December 2004, however during a circularisation burn the upper stage of the carrier rocket shut down prematurely, leaving the spacecraft in a lower-than-planned orbit. Sich-1M was able to be operated in this orbit; however it decayed on 15 April 2006; less than sixteen months into a planned three-year mission. As has become relatively common for Dnepr launches, several other satellites joined Sich-2 for the ride into orbit. In this case, seven secondary payloads were launched. NigeriaSat-2 is a 300-kilogram observation satellite which will be operated by Nigeria’s National Space Research and Development Agency (NASRDA), with a planned operational lifetime of 7.4 years. A second NASRDA payload, NigeriaSat-X or NX, was also launched on the Dnepr. Both NigeriaSat-2 and NX were constructed by Surrey Satellite Technology (SSTL) in the United Kingdom. NigeriaSat-2 is based around the SSTL-300 bus, whilst NX is based on the SSTL-100 bus, with a mass of 100 kilograms. Both satellites are equipped for Earth observation; NigeriaSat-2 carries a high-resolution imagery payload, whilst NX is equipped with a trispectral imager with a resolution of 22 metres. NX was primarily built to train Nigerian engineers in satellite construction techniques by working with SSTL engineers. A pair of AprizeSat spacecraft, to be operated by Argentine communications operator Aprize, have also been placed into orbit. The 12-kilogram AprizeSat-5 and 6 satellites will be used for store-dump communications, and also carry Automatic Identification System transponders to track ships at sea. These are the seventh and eighth spacecraft in the AprizeSat constellation, which was originally named LatinSat. 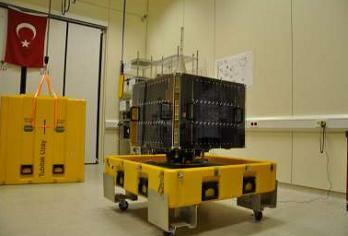 The first spacecraft, LatinSat A and B, were launched in December 2002. So far, all launches have taken place in pairs, using Dnepr rockets. 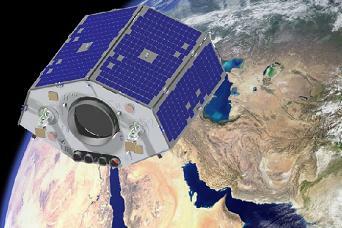 RASAT is a Turkish remote sensing satellite, intended to replace the BILSAT-1 satellite which ceased operations in 2006. It is the first Turkish-built spacecraft to be launched: all of Turkey’s previous satellites have been constructed by other countries. RASAT carries a multispectral imager with a resolution of 15 metres, and a panchromatic imager with a resolution of 7.5 metres. The EduSAT spacecraft, which will be operated by the Sapienza University of Rome, is a technology demonstration nanosatellite, which will test solar cells, a transponder, and techniques for deorbiting spacecraft. It also carries a scientific payload to measure the flux density of solar radiation, study Earth’s magnetic field, and to measure incident cosmic particles and rays. It is not related to the Indian Edusat, or GSAT-3, satellite. The final payload, Blok Perspektivnoy Avioniki 2, or BPA-2, has intentionally remained attached to the upper stage of the Dnepr. It is conducting a brief mission to study the use of navigation equipment in space. A previous mission, BPA-1, was conducted last year, attached to the upper stage of the rocket which launched the Prisma and Picard satellites. The Dnepr carrier rocket is derived from the R-36 missile, a silo launched missile originally designed to drop large thermonuclear warheads on the United States. Along with the UR-100, it became one of the Soviet Union’s first storable-propellant intercontinental ballistic missiles, capable of being stored fully-fuelled for long periods of time. Later versions flew with multiple independently targetable reentry vehicles, with around ten warheads. The R-36O, which first flew in 1965 and was deployed operationally between 1969 and 1983, was a derivative developed as part of the Fractional Orbit Bombardment System (FOBS). FOBS reentry vehicles were placed into orbit, and then deorbited over their target on their first orbit of the Earth. By deorbiting before a full revolution was complete, the Soviet Union hoped to circumvent the ban on placing nuclear warheads into orbit. Dnepr is not the only orbital launch system derived from the R-36. The Tsyklon family were also developed from it, with the first version, the Tsyklon-2A, flying in October 1967. This was followed by the operational Tsyklon-2, initially intended for tests of anti-satellite weapons, and the three-stage Tsyklon-3, capable of placing payloads into sun-synchronous orbit. The Tsyklon-2 made its final flight in 2006, and at the time it was statistically the most reliable orbital carrier rocket in service. The Tsyklon-3 made its final flight in January 2009, leaving no Tsyklon rockets in service. 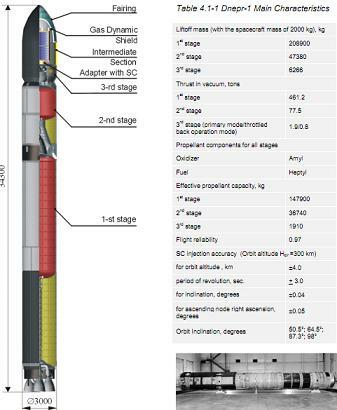 Ukraine and Brazil have been developing a new variant, the Tsyklon-4, which would be a Tsyklon-3 with an enhanced third stage, allowing it to launch communications satellites into geosynchronous transfer orbits. If political issues regarding the project can be resolved, the maiden flight is currently expected to occur no earlier than 2014. Dnepr is a three-stage rocket derived from the R-36M2 variant of the R-36. It first flew in April 1999, carrying the British UoSAT-12 spacecraft. The launch of Sich-2 marks its seventeenth flight, and its sixteenth successful launch. All three stages of the Dnepr burn unsymmetrical dimethylhydrazine propellant, which is oxidised by dinitrogen tetroxide. The first two stages of the Dnepr are unmodified R-36M2 stages. At liftoff, the rocket was propelled out of its silo by a gas generator, which then separated from the rocket. The first stage was powered by four RD-264 engines, which ignited shortly after liftoff, at an altitude of 20 metres, and burned for approximately 98 seconds. The second stage, with a single RD-0255 engine, ignited about six seconds after the first stage had completed its burn. In that time, the first stage was jettisoned. During the second stage burn, the payload fairing was jettisoned. The fairing was one of two structures that encapsulated the satellites, and its function was to protect them from aerodynamic forces as the Dnepr climbed through the atmosphere. The other structure was a gas dynamic shield to protect the satellites from the exhaust of the third stage engine. The second stage burned for about two minutes and forty eight seconds before shutting down. It separated, and the vehicle entered a coast period. After coasting, the third stage ignited. The third stage was also essentially unmodified from the R-36M2, with the only major changes having been made to provide payload interfaces to its electrical and control systems. The third stage was powered by a four-chamber RD-869 engine, which was mounted firing towards the nose of the vehicle. This configuration stemmed from its originally application of deploying MIRVs, which required it to deploy multiple warheads quickly onto multiple trajectories. Immediately after ignition the third stage rotated through 180 degrees before ignition, to orient its engines for forward flight. Upon approaching the target deployment orbit, the gas dynamic shield was jettisoned, followed by separation of the first spacecraft. At this point the third stage was still firing, providing separation distance for the next payload. Once all of the payloads had separated, the third stage continued to burn in order to remove itself from the vicinity of the payloads. Like the R-36 from which it is derived, the Dnepr launches from underground silos. 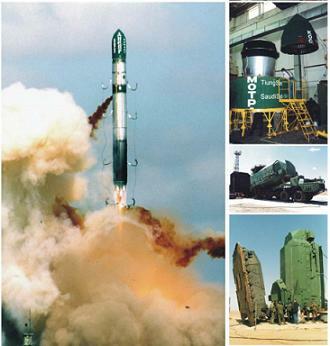 Sich-2 was launched from Dombarovsky, an aircraft and missile base near the town of Yasny in Orenburg Oblast. This was the fifth Dnepr to launch from Dombarovsky, which was first used for the launch of Genesis I in 2006. Silo 370/13 has been used for past Dnepr launches from the base. The next Dnepr launch is expected to occur later this year, when the KOMPSat-5 satellite will be placed into orbit from Dombarovsky.